This Ongoing War: A Blog: 22-Apr-14: Attention World Council of Churches: Will you now follow your own advice and speak up for the Arabs tortured and imprisoned by the PA? This blog post is about blatant hypocrisy. 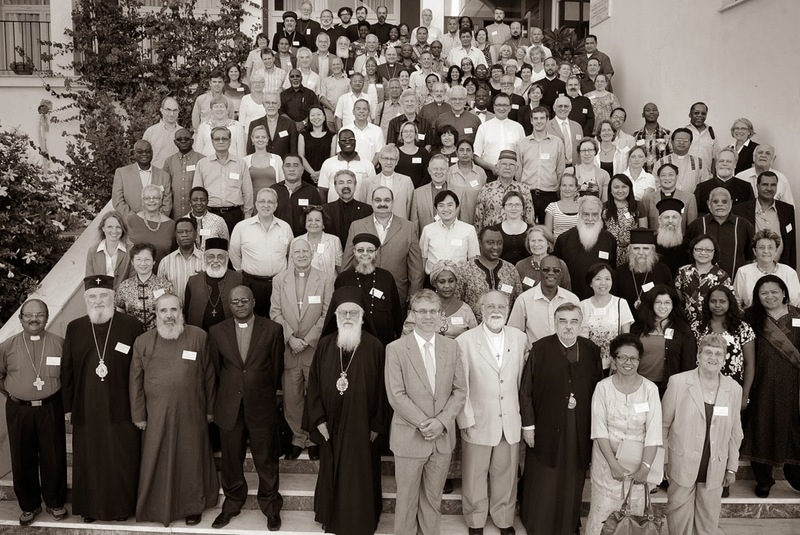 It takes the form of a constructive and sincere suggestion for the World Council of Churches, and in particular for its chief executive Olav Fykse Tveit. "to pray for, visit, and tend to the needs of all prisoners, no matter the reason for their detention. For Israel and Palestine, prisoners have taken on even greater significance than in the past." As disgusting as this well-publicized bit of playing to certain kinds of grandstands is, we feel - in the interests of fair play - that it creates a precedent for the world's most significant aggregation of non-Catholic churches to act, to speak out, in light of some very disturbing revelations made today. They come from an Arab journalist who formerly plied his trade inside the Arafat-controlled Palestinian Authority until he walked away some years ago appalled by what was being done there to his people. The journalist's name is Khaled Abu Toameh. We have had the privilege of quoting him often in our blog [here, for instance: "30-Sep-12: While Abbas regime sends protestors into streets to decry Israeli imprisonment of terrorists, they quietly arrest Abbas' opponents"] because, unlike almost all of the foreigners who claim to report on the inner doings of the Palestinian Arab leadership and the society on top of which it sits, he speaks their language, he lives among them, and he has a career-long, well-earned reputation for integrity and simple courage in uncovering the unvarnished truth about the Arafat, Abbas and Hamas regimes. continue to hold hundreds, if not thousands, of Palestinians in prison, some tortured, some without trial. This year alone, the Palestinian Authority has arrested 357 Palestinians accused of security/political offenses, 42 of whom are university students. Of course, the arrests continue to be ignored by the mainstream media in the West. This is a story that does not reflect negatively on Israel, so is therefore not considered worthy of being reported to Western audiences.... In March alone, Palestinian Authority security forces raided and searched 42 private and public institutions, businesses, hospitals and charitable organizations in the West Bank... the Palestinian Authority security forces were continuing to torture detainees. Please notice that not a single one of the men and women tortured and imprisoned by their PA brothers is accused of murder. This is significant because, by contrast, the fury emanating from the PA and their friends over Israel refusing to deliver up last month another tranche of convicts to the PA 'hero of the day' process is about convicted murderers: men who are proud of the lives they snuffed out, and which are now supposed to be their passport to fame, adulation and respect at the hands of the Palestinian Authority. As we have written here many times in the past nine months, a peace process in which committed murderers are deliberately and repeatedly turned by one of the parties in the conflict into heroes whose homicidal exploits are celebrated as examples for others to follow, is no peace process at all but a march towards victory. international commissions of inquiry to Israeli prisons to look into Israeli "violations" against the Palestinian inmates [and] accusing Israel of "war crimes" because of its "mistreatment" of the prisoners. So let's ask Dr Tveit and/or Mrs Ashrawi whether the torture and imprisonment of Palestinian Arabs by the armed men of the Abbas regime deserves the same sort of attention, the same kind of commissions of inquiry, the same sort of "freedom with justice and dignity" that they are demanding of the Israelis. And if not, then perhaps these ever-talkative "peace" champions can explain to us why it's only the Arab murderers and practitioners of terror (always directed at innocent Israeli civilians, like our murdered daughter) for whose benefit their unconscionable and ill-considered appeals are made. UPDATE April 24, 2014: We forwarded this post by email to Dr Tveit at the WCC. Stay tuned for his response.